Isobel Attwood joined the Club in 1986 when she retired from the Kyabram Cannery. Isobel recalls “half of Kyabram worked at the cannery and when you retire, joining Uncle Bobs Club was the thing to do those days”. Isobel was a member with the Club for 5 years, she then became Vice President and then President from 1992 – 2017. When we chatted with Isobel about her time with UBC, she tells us about organising golf days, bowls days and Christmas Charity Night. Her work on local charity raffles in Kyabram has raised a lot of money for the Club and this amazing lady keeps going through illness and personal tragedy. When membership of Kyabram dwindled, Isobel still managed to encourage new members and through her efforts has kept Uncle Bobs functioning in Kyabram until 2017. 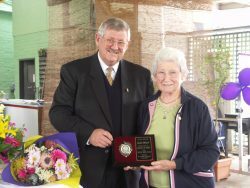 Isobel was awarded the meritorious award back in 2013 but her most memorable moment with UBC was when she was awarded the life membership back in November 2007, presented to her by the late Bob Willey. She recalled that moment as “a very big shock to me”. She was really lost for words. These days, Isobel spends her time doing the crossword puzzle and enjoying the morning sun.